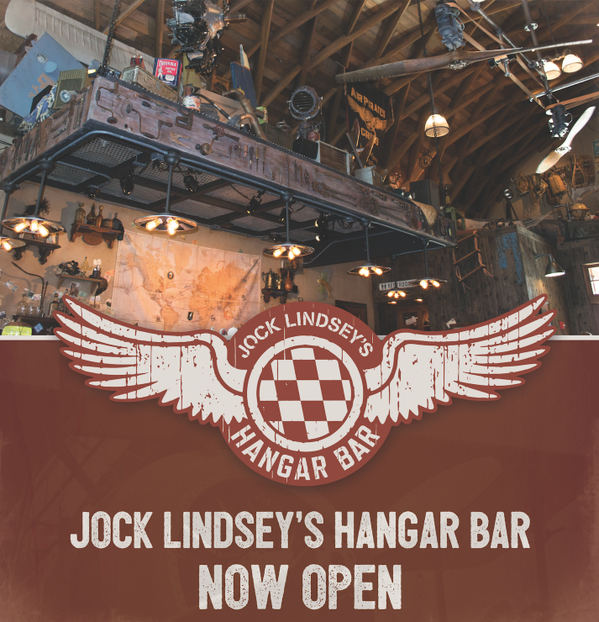 Jock Lindsey’s Hangar Bar is now open at Downtown Disney! This new restaurant is aviation-themed and is named after the pilot from the Indiana Jones films. Jock Lindsey’s is located in between Paradiso 37 and the BOATHOUSE. It is a family-friendly waterfront lounge with seating for 150 guests and seating is available both indoors and outdoors. Guests who visit the lounge will want to take their time and really explore as there are so many great details that pertain to things like Indiana Jones, The Society of Explorers and Adventurers, Adventureland, and even the former Adventurer’s Club. Indy and Jock stumbled on Disney Springs in 1938 while chasing down a mythology-based tip in central Florida. Attracted to the town’s natural springs and lush terrain, Jock bought some waterfront property and eventually settled down, piloting seaplane tours across the fast-growing Sunshine State. Jock eventually built an airplane hangar, air tower and runway, and invited fellow members of The Society of Explorers and Adventurers to pay him a visit. His home base soon became a popular stopover and watering hole for world travelers and locals alike. Another new addition opened today, though this addition is a little less exciting. Located next door to Jock Lindsey’s is The Landing boat dock which is open once again. (It used to be the Pleasure Island boat dock.) Transportation to Disney’s Old Key West Resort and Disney’s Saratoga Springs Resort will return to docking at this location and transportation is available about every 20 minutes. Jock Lindsey’s Hangar Bar is open Sunday through Thursday from 11:30 a.m. until 12:00 a.m. and on Friday and Saturday from 11:30 a.m. until 1:00 a.m.
Construction walls were still up when I passed by yesterday. Things obviously moved very quickly. Perhaps if this place is a success, it can expand and add full meal service. One of the CMs I spoke with said they hired a few of the staff from Trader Sam’s to move to a bigger “show space”. I want to know what Knob Creek Disney Select is…already my favorite bourbon. Distilled with pixie dust, I assume?